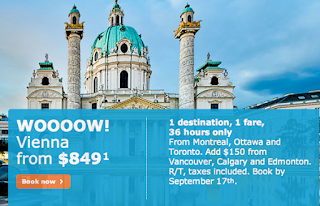 Rewards Canada: September 16 Update: The new VIPorter program offers up to a 7% return, Fairmont offer for Scotia Amex Platinum and much more! September 16 Update: The new VIPorter program offers up to a 7% return, Fairmont offer for Scotia Amex Platinum and much more! Here are Wednesday's news, bonuses and travel deals! We now know that you'll get a 5 to 7% return on spending with the new Porter VIPorter program! Read our review of the new program here. Not sure when this benefit was added as I just came across it but if you hold the Scotiabank Platinum American Express Card you can get free Premier membership in Fairmont Hotels President's Club and Platinum after 5 stays. You must register by December 1st. Find out more here. Its Wednesday so that means KLM's Wild on Wednesday is here! Today's offer is Vienna for $849 all in from the East or $999 all in from the West. Book by Sep 17 for travel Find out more here!